Actinidia chinensis syn. 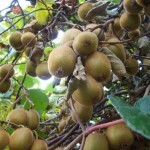 Actinidia deliciosa is also known as Chinese gooseberry, Yang-tao in Chinese, kiwifruit or simply kiwi. It is a vigorous decidious vine which is native to China, and that can be up to 30 ft (10 m) long. 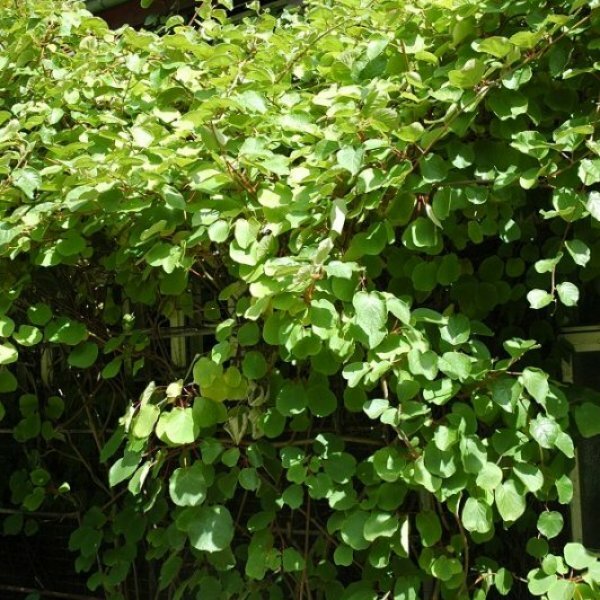 This vine bears white flowers and ovoid edible fruits. Leaves - The kiwi has a decidious foliage. Leaves are wide, and can be up to 8 in (20 cm) long. Young shoots are slightly pubescent, with a red-green color. Older leaves are glabrous, and deep-green. Flowers - This vine has white to white-cream fragrant flowers. 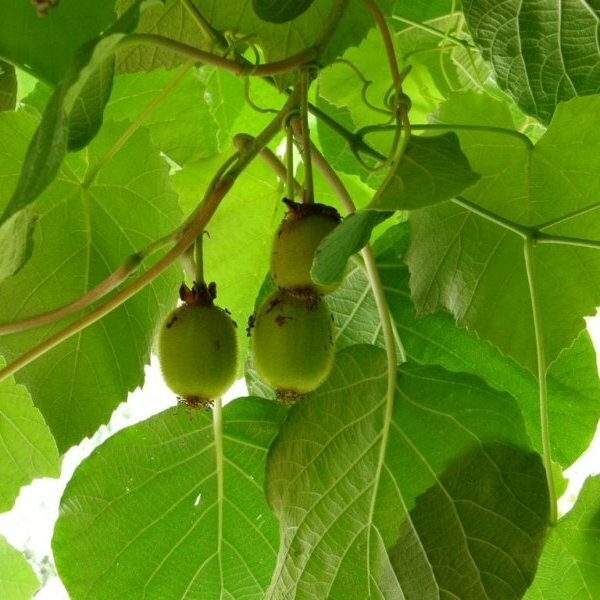 It is generally a dioecious plant, which means that both a male vine and a female vine will be required for fruit production. Some cultivars like 'Solo' are partly self-fertile. 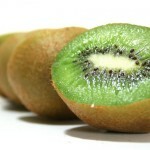 Fruits - The kiwi is an ovoid fruit, which can be up to 2.5 in (6 cm) long. 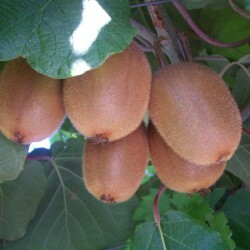 The skin is brown and has dense brown hairs. 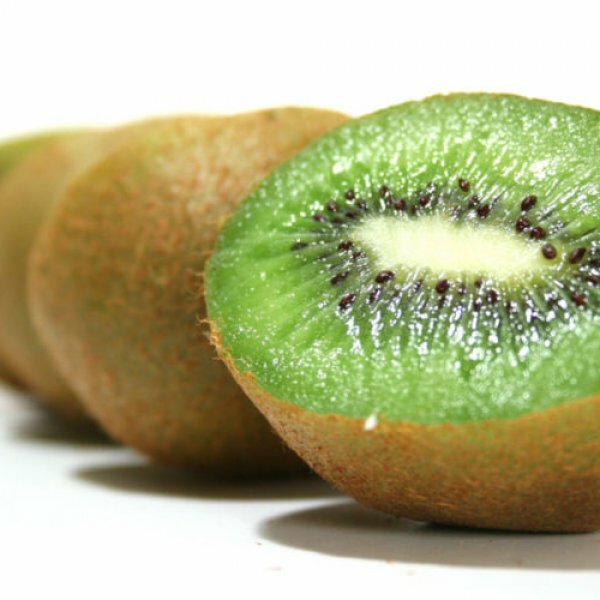 The flesh is green and contains numerous tiny black seeds. Germination 1. Fill a nursery flat or other germination container, to within 1/2 inch of the rim, with a sterile germinating mix. Moisten the mix thoroughly. 2. Sow the Actinidia seeds on the surface of the mix. Moisten the seeds and place the flat in a cold frame or in the refrigerator at +2-+4C for three months. Keep the seeds moist during this period. 3. Remove the flat from the refrigerator and place it in an area with indirect sunlight and where the temperature remains between 50 and 68 degrees Fahrenheit. 4. Place a fan either to the side of the flat or overhead, set to low speed, to provide air circulation. Seeds are susceptible to damping off – a fungal disease that kills seeds and seedlings. Good air circulation is one method of avoiding the disease.